I wrote this essay back in 2001 during my period of away from Christianity, while I was exploring Vipassana Buddhist Meditation. Prayer is conversation with God – to me it is mostly worship, giving thanks, supplication, and listening. Vipassana, of course, depreciates prayer, since, in true Buddhist fashion, it denies that a personal, transcendent God exists – only natural law – so prayer is seen merely as a superstitious exercise. I do not pray much now, mostly because I do not trust what I hear in prayer. It is more probable that the voice of god that I hear in prayer is my own, perhaps my ‘internalized parent’, in TA terms. That voice has been wrong so often that at best, I am misinterpreting God, but more than likely, it has always been me – maybe ;). Previously, when I had a spiritual or emotional revelation, I would say ‘God showed me’ or ‘God told me.’ It is perhaps true that God allowed or delivered these revelations, but perhaps I just realized these things as part of the awakening process – similar to physical growth – I never say ‘God made me get taller’ or ‘God is making me get older’ – it just happens. So perhaps God is the architect, but I should not blame every ‘revelation’ I have on God. Let God have credit for the whole thing, I don’t care. So prayer is an enigmatic, ambivalent exercise for me. I supplicate, but leave the answers open to whatever follows. I brought you here to learn a lesson. Let it teach you. You said you were miserable and needed new truth, and here you are. You can let go of Me. If I am real, I will not let go of you. If I am not real, then you are better to let go of whatever illusions you have. I had a relatively distinct awareness that I was where I was supposed to be – my previous reading of Serene Compassion: A Christian Appreciation of Buddhist Holiness (Carmody) prepared me for the Buddhist underpinnings, and my reading in A Path With Heart (Kornfield) gave me an intro to sitting meditation. What was disturbing was the pain in my knees, which lasted for at least a week post-course in my left knee. I don’t want to damage my body. I want to re-emphasize that in the midst of my profound wrestling over the existence of God, I turned to prayer and to the inner voice, no matter how little I trusted what I heard. In the end, I had to trust in the care of God, but not necessarily Jesus. I am wondering if Borg is correct – that Jesus was deified after the fact by his followers. Mindfulness meditation is practical in it’s various forms, and vipassana claims to be the pure form of the original Buddha. Its goal is equanimity, and purification of our past and present negative actions and reaction patterns through observation of bodily sensation. No Physical Component: Yoga and exercise can accomplish this. No Intellectual Component: This may be merely my perspective after experiencing the ten day course, which is designed for beginners, and is meant to be skewed towards experience and away from mere intellectual approach to truth. Although I had previously relied upon a doctrine that balanced experience with doctrine (to avoid the extremes of heresy or Pharisee), vipassana has a very low view of any type of ‘blind faith’ in doctrine or deity – so they would not agree with Augustine’s discussion of faith and reason – since to them, the only truth that is true is that which I have experienced and incorporated into my life. 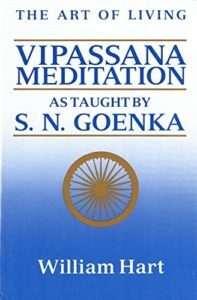 Goenke emphasized that one does not have to adopt a Buddhist world view (or any) to practice vipassana. The basic assumptions and method are described, and from there, one must practice. My perception is that Goenke’s aversion to intellectual truth and blind faith is somewhat understandable, but I think he downplays the role of intellectual discipline in spirituality too much. Lucky for me there is a significant body of literature to study. This practice is viewed as unnecessary in vipassana. Rather, equanimous observation is presented as the remedy for all sensations. Secondly, vipassana devalues the healing power of truth heard and apprehended via the mind – so re-education of the mind and conscience through teaching and study is considered ineffective, or counter-effective as compared to the experience of vipassana. Of all the spiritual disciplines, yoga is my favorite. It combines the awareness of meditation with self-care of the body. I will probably practice yoga for the rest of my life. My spiritual path over the last couple of years has required me to let go of my doctrines, rather than continue to modify and build them – so much of my time is spent unlearning, not learning. I have studied enough. I must practice now. I have grown tired of searching. Many of my pains have been healed, and I am less driven to find answers. And I am tired of searching, in part bc I am older, and in part bc I believe I have sampled all of the solutions and philosophies out there. I realize that I must combine what I know with my own ongoing experience of reality and figure it out from there.. I came to believe that my cravings and addictions are making me unhappy, and that practicing vipassana can open up the world of egolessness and compassion within me and help free me from my deeply learned patterns. I released my Christian doctrines more in response to my understanding that I MUST let go to follow the Divine to true happiness, joy, and peace. Truth and love at all costs, if I am able! I am reminded of Abraham, who was told by God to kill his son. This sounded like something the pagan gods did, but Abe felt that this was the path God had for him, and he went up there figuring that somehow, God could work it out. And so with me – I feel like I must let go of my previous faith (i.e. kill it) in order to grow and heal – so be it – may God resurrect what is true in me at the proper time. Why should I be miserable resisting the spiritual process in my life? I realized the great value of my family and friends. Of course, in vipassana, this type of ego-based relationship (i.e. one of favoritism and attachment to certain people) is perhaps unspiritual or un-liberated. But I do now see how critical people are. For those considering a Vipassana retreat, I have only one thing to say – it is no picnic. It was not restful or fun, It was physically and emotionally difficult, though quite fruitful. To continue to benefit from it, they recommend two hours a day (one hour morning and evening) for a year. I have not kept the disciplines, though I always mean to. I intend to do another 10 day course perhaps in 12-18 months – and before then, I want to try to apply it daily.